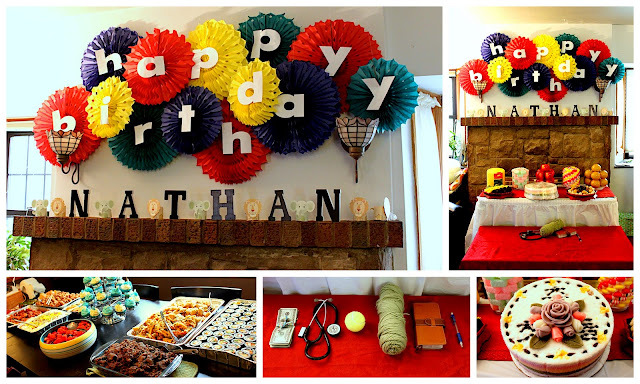 ﻿﻿We celebrated Nathan's one-year birthday on September 26. In Korean tradition, the one-year birthday (called "dohl") is a big celebratory event because long ago, many children didn't make it to their first birthday. It seems like the current trend is to throw incredibly elaborate dohls which could easily end up costing a couple grand (if not more). I always thought this was absurd considering the baby wouldn't even remember the birthday! But tradition is important and every birthday is worth celebrating, so we have been elaborate while trying to keep the costs affordable. 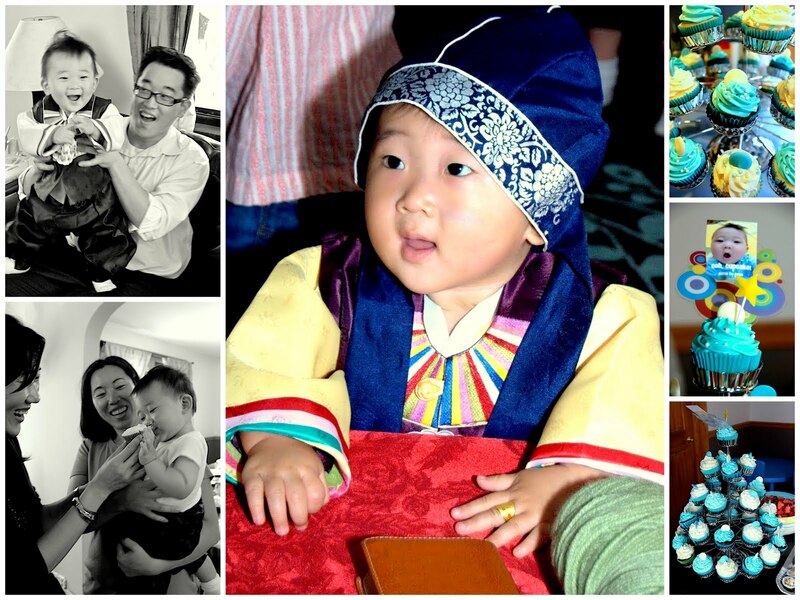 For each of my sons' dohl, we incorporated the traditional elements such as the hanbok (Korean outfit), duk (rice cake), dohljabi (selecting an item to foretell future), and colorful decorations. 1) Make your own decorations. The "Happy Birthday" banner above the fireplace served as the main decoration. I got the idea for the tissue fans from Martha Stewart and found them for a really great price at Devra Party (twelve 18" fans for $10). Cutting the fans into various sizes and hanging them was probably the most time consuming part of decorating but so worth it. I simply printed out the "Happy Birthday" letters on white cardstock paper, cut them out, and then taped them onto the fans. The dohljabi items (bottom center) were gathered from around the house. 2) When you're serving more than 15 guests, it's sometimes easier to order food than prepare it but you can do both. Order a few main dishes (li.e. gimbap, fried shrimp, chicken wings, bulgogi) and make a few side dishes (i.e. pasta, salad, and noodles). We also ordered the rice cake from a caterer in Palisade Park; they also supplied the plastic fruit display for free. 3) When it comes to favors, I've learned from past experience to keep it simple. I found some simple and adorable mini pinball games at Michael's in their clearance section for $.49 each (top left) and decorated it with ribbon. 4) For additional personal touches, I printed out photos of the birthday boy and placed them in various places. The train photo piece (upper righthand corner) came from Michael's as well. 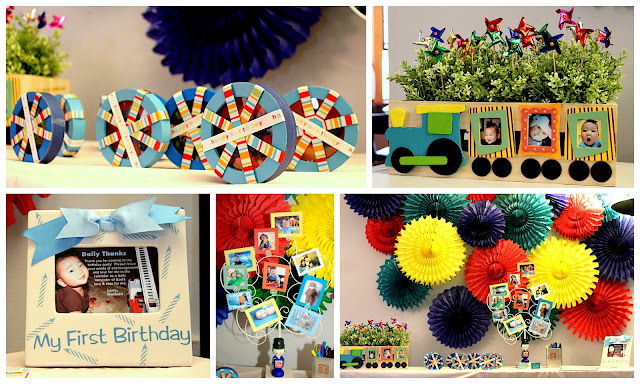 You can purchase the wooden cd case, train decal, wheels, and frames separately. The photo frames come painted, so I just had to handpaint the train and wheels with acrylic paint. I then put in flower pots and inserted these colorful pinwheels from Pier 1 Imports (set of 16 for $2). the cute 1st birthday photo frame (bottom left) was a gift from our cousins. The white photo tree (bottom center) was also a fabulous Pier 1 Import find (in the clearance section for $7). 5) Keep the dohljabi game simple. I've seen people spend lots of money to make posters for this game, but it's so simple to create your own. 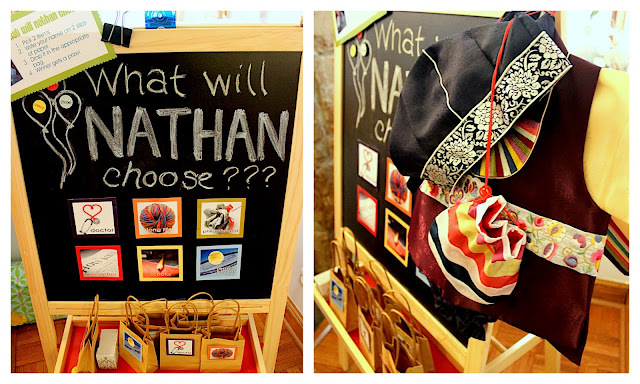 I simply printed out photos of the different items and placed them on the kids' easel (courtesy of Ikea). Then I glued the same photos on little brown bags from AC Moore ($1 each). Guests wrote their names on little sheets of paper and dropped it into the bags. Winner got a small gift card to Starbucks. 6) Rent or borrow a hanbok. Here's our sweet birthday boy! He was rather uncomfortable in the hanbok (traditional Korean attire) so it was hard to get a good photo of him. We ordered the hanbok from ebay, but you might be able to rent one or borrow from family or friends. 7) Make your own cake or cupcake. Despite being uncomfortable, he had a great time especially when it came time to eat cake! Instead of purchasing a cake, I decided to bake simple vanilla and chocolate cupcakes instead. These were super easy to make and piping the swirls on top was really simple. Here's a great website for learning how to pipe swirls and great cake ideas in general. Though we were able to save costs, it did take a lot of work and preparation on my part (lucky for me I had just quit my full-time job). It was a splendid affair for our little guy and worth every effort. Did you do all the decorations yourself? You're a superhero mum lol and Nathan look so adorable. great decoration its really nice ... Great party.. Congratulations.. you did great.. Your thoughts and comments are always appreciated. 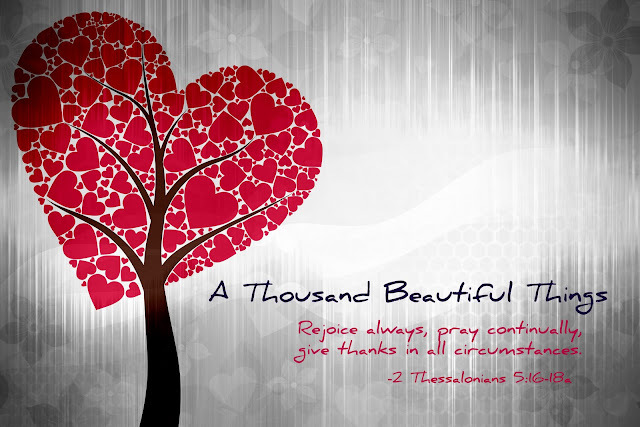 My ongoing list of a thousand beautiful things.